Ground test version of the Orion multi-purpose crew vehicle (MPCV) inside the Operations and Checkout (O&C) building at NASA’s Kennedy Space Center in Florida. The capsule is being used to ready the facility for the arrival of the first MPCV that will fly into space. CAPE CANAVERAL, Fla. — A test spacecraft that in two years will fly deeper into space than any vehicle designed for astronauts since NASA's Apollo moon program is set to arrive here next month, where it will be assembled in the same facility that readied the moon-bound spaceships 40 years ago. Parts for the first space-bound Orion Multi-Purpose Crew Vehicle (MPCV) will arrive in June for final assembly in the Operations and Checkout (O&C) building here at NASA's Kennedy Space Center. Lockheed Martin Space Systems, under contract to NASA, has overseen a $55 million renovation to the historic facility, which is now ready to begin processing the next generation capsule for its planned 2014 test launch. NASA and Lockheed Martin toured SPACE.com and other members of the media through the O&C Thursday (May 17), where a ground test version of the Orion capsule is being used to make final preparations for the arrival of the first space-bound craft. "We made extensive modifications to the facility," Kemp said. "A lot of the things we did to the facility was to make it more flexible," Kemp explained. "I think if you go into most of the facilities on this campus [at Kennedy Space Center], you'll see a lot of structures bolted to the ground. Anywhere you are bolting something to the floor, you are creating a unique place that can't be used for anything else. You've created a monument. So we designed this thing with no monuments." Kemp noted that almost everything in the O&C are on wheels and on air bearings so that workstations could be moved around as rapidly as required. Running along the base of the floor are steel plates covering utility service locations, so portable power and tool carts can be plugged in wherever they are needed. "The investment that you make when creating a facility this way — which is actually less expensive to build — is that you have full flexibility in reconfiguring your factory," he said. "And if you design all your tooling and equipment to move very readily in that factory, you can redesign the building in rapid fashion." Kemp said that this type of modular work-flow is rare, not only within Lockheed's other divisions but in the aerospace industry as a whole. "Lean production has been around for quite a while, but it is now finding its way into the aerospace business," Kemp told SPACE.com. The most prominent part of the redesigned O&C workstations is located about halfway down the 70,000-square-foot (6,500-square-meter) high bay. Currently occupied by a ground test version of the MPCV, the test stand will soon be occupied by the unmanned capsule that is set to launch on a demonstration flight in 2014. "What what we're using [the ground test capsule] for is to actually test out all of our ground equipment," Kemp said. "We're kind of fit-checking it here in the workstation, making sure operationally we know how to get it in and out." Temporary lighting and work platforms are also being adjusted to prepare for when the capsule begins assembly. 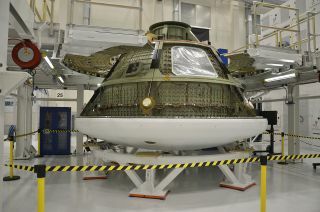 "The vehicle we're getting ready to start on here is for our flight test to go into space," Kemp said. "The mission for that [capsule] is going to be a high velocity re-entry, so it is going to go beyond low-Earth orbit, which is an important thing for us. Our vehicle is designed for exploration, so it needs to be able to handle higher velocity re-entries." The test flight, which will launch on a United Launch Alliance Delta 4 Heavy rocket, will take the Orion MPCV capsule to an altitude of more than 3,600 miles (5,800 kilometers), or more than 15 times farther away from Earth than the International Space Station. Orion will return home at a speed that is almost 5,000 mph (about 8,050 kph) faster than any current human spacecraft. It will test the kind of return that will be required when astronauts come home from voyages beyond low-Earth orbit, such as to an asteroid or Mars. As the Orion capsule re-enters the atmosphere, it will endure temperatures of almost 2,000 degrees Fahrenheit (1,093 degrees Celsius), higher than any manned spacecraft since astronauts returned from the moon. "This operation is all about agility and change. We're doing a development article and it is the first time we've built a capsule in a very long time and we've never built something this big," Kemp said. Robert Pearlman is a contributing writer for SPACE.com and the editor of collectSPACE.com. You can follow him on Twitter @robertpearlman and @collectSPACE, or on Facebook. Follow SPACE.com for the latest in space science and exploration news on Twitter @Spacedotcom and on Facebook.